Well, it's finally here; the American Craft Council's St. Paul show is this weekend. 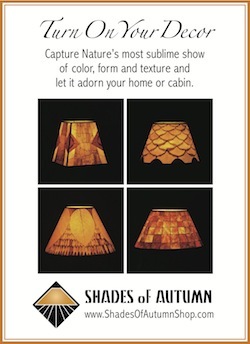 After five months of intensive work — collecting and processing leaves; producing a range of lampshades to display; creating and producing my Shades of Autumn graphics and collateral material; and designing and outfitting my booth — I think I'm ready to let go and truly enjoy this amazing experience. If you're in the Twin Cities Metro, I hope you'll come and enjoy all the extraordinary crafts at this awesome show. And while you're there stop by my booth to say hello and see what I've been up to all this time. Regular show dates are Apr. 5-7 (Friday through Sunday), with a special preview event the evening of Thurs., Apr. 4.